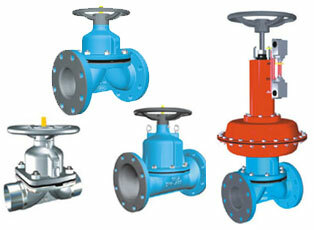 The diaphragm valves are mainly used in water treatment plants, fertilizer & petrochemicals industries, chemical industries, refineries, thermal power stations, and other process industries. Equally suited to on and off, or flow control applications, a diaphragm valve will handle positive pressures or high vacuum. Due to the wide range of material options it will handle almost all applications within its temperature and pressure ranges (175°C max. and 16 bar max.) and as such is used in almost every industry on both corrosive and abrasive applications. All working parts are isolated from the line media which enhances its reliability. Maintenance is a simple task with the body remaining in the pipe, the valve thus being field serviceable. It has linear flow characteristics which makes it well suited to throttling or modulating duties. On/off and control automation is possible with the use of modern compact actuators and accessories.